Takbo Para sa Lake Sebu this Nov. 10! In celebration of the 16th Helobung Festival and 29th Foundation Anniversary of the Municipality of Lake Sebu this coming November 7-11, 2012 (schedule of activities here) , the Local Government of Lake Sebu in coordination with the Lake Sebu Eco Tourism Council invites everyone to join the first TAKBO PARA SA LAKE SEBU on November 10! 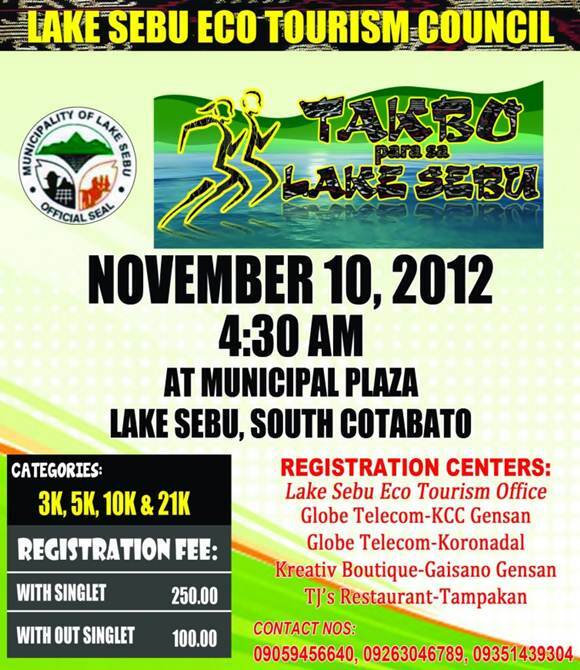 A fun run for a cause, Takbo Para sa Lake Sebu's objectives are to make people aware of the lake's present condition, the advocacy to restore its natural state, and the promotion of Lake Sebu's eco-tourism potentials. Takbo para sa Lake Sebu has different categories to choose from, such as 21km Barefoot Running, 21km Open Category, 10km, 5km and 3km. Registration fees are at P 250.00 (with souvenir shirt) and P 100.00 (without souvenir shirt). Exciting prizes are at stake, aside from cash, four (4) brand new cellphone units and other gift items from one of its major sponsors will be given away. Visiting runners who arrive a day before will be given free accommodation (tent/ camping style) in identified resorts by the Municipal Tourism Office. Register Now! Let us run and have fun together as we do our share in caring our environment. Takbo para sa Lake Sebu!